I’m working through my obsession partly by writing about it .. and probably making it far, far worse! But at least I’ve completed this very practical guide and deposited it as the first entry in a new folder Thames Foreshore in the main menu strip. The guide even includes an illustrated list of the different kinds of mud, which in its seriousness may be amusing to some! But I’ve chosen not to preview that particular part as an excerpt here, rather this other part. 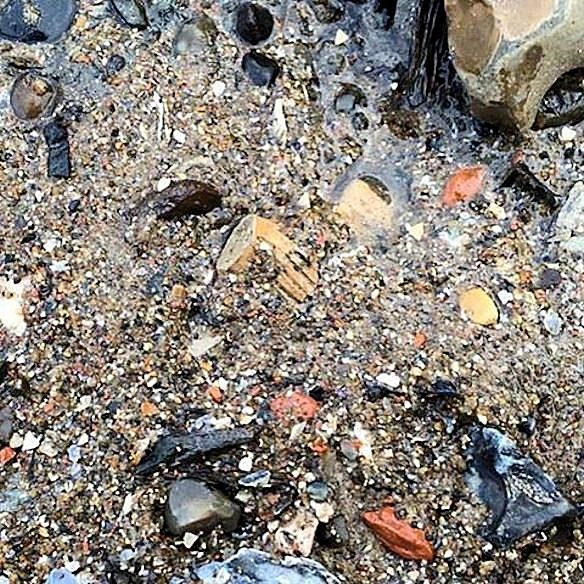 As I said, different spots may offer up more than others if you’re just looking for historical human artefacts but if, like me, you’re just as keen to see interestingly shaped stones, driftwood or unexpected flotsam .. just about any point on the Thames Foreshore will do! Most locations have either patches or whole banks of shingle, some interspersed with areas of sand, others with areas of mud. Regarding those ‘stones’, I had, as it were, questioned their authenticity earlier. What I meant was that much of what first appear as nicely weathered, rounded pebbles are fragments of brick or roof tile, or natural chalk which was ‘shipped in’ and laid down as more comfortable beds for the barges. There are pebbles, mainly flint, which were naturally deposited by successive glacial actions up to the last Ice Age around 21,000 years ago .. but many of those, especially the larger and more weirdly shaped nodules, could have just as likely been shipped in along with the chalk. 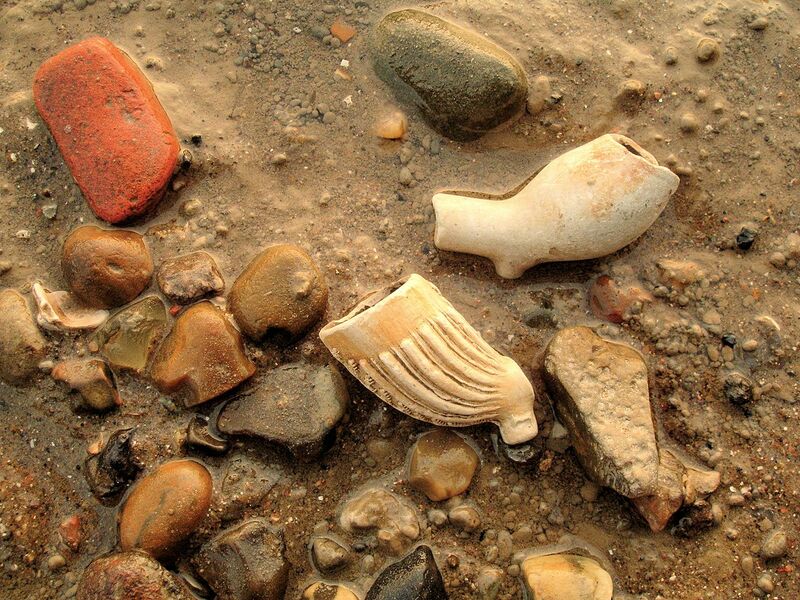 For most visitors the fragments of clay tobacco pipe are the most memorable novelties, and a trademark of the Thames foreshore. Pieces of pipe-stem are easy to pick up in certain areas, complete bowls less so .. but spend enough time on the first type of mud featured earlier and you may even extract a perfectly preserved bowl with a few inches of stem! 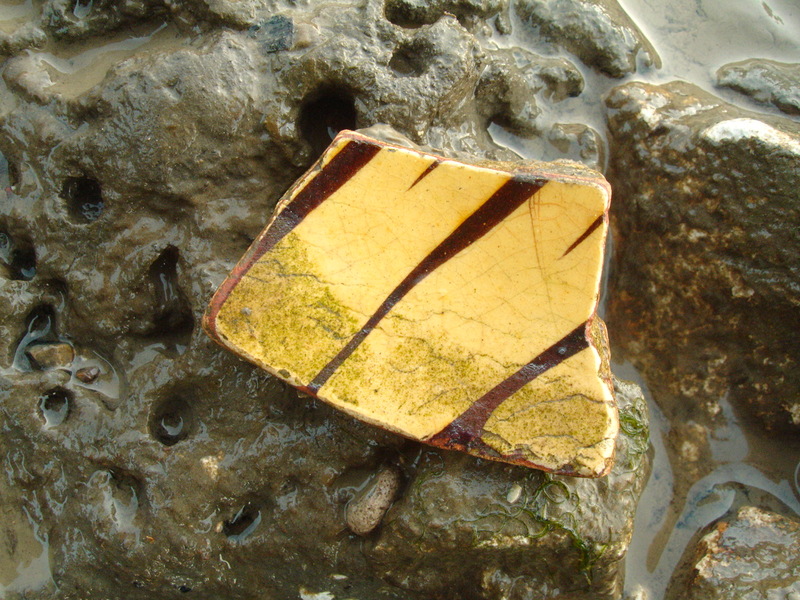 There are so many fragments, not just because for more than 300 years they were sold filled and routinely chucked when smoked, but also because the hundreds of pipe-makers working along the foreshore would likely ditch their kiln leftovers or rejects into the Thames. Even today most will be found close to where the numerous ferries used to transport workers either across or along the Thames, because although the Thames currents will move many things around over the course of time the mud will also tend to accept, envelope and preserve many things where they fell. Because of that it’s not unheard of to find complete ones, which could sometimes be more than a forearm in length! Clay pipe bowls can be dated with some certainty according to their shape, size and decoration, and with even more accuracy if they feature a maker’s-mark on the ‘heel’, the protrusion under the bowl. The top pipe bowl above dates from 1640-60 while the one below is a fairly typical decorated one from 1780-1820. 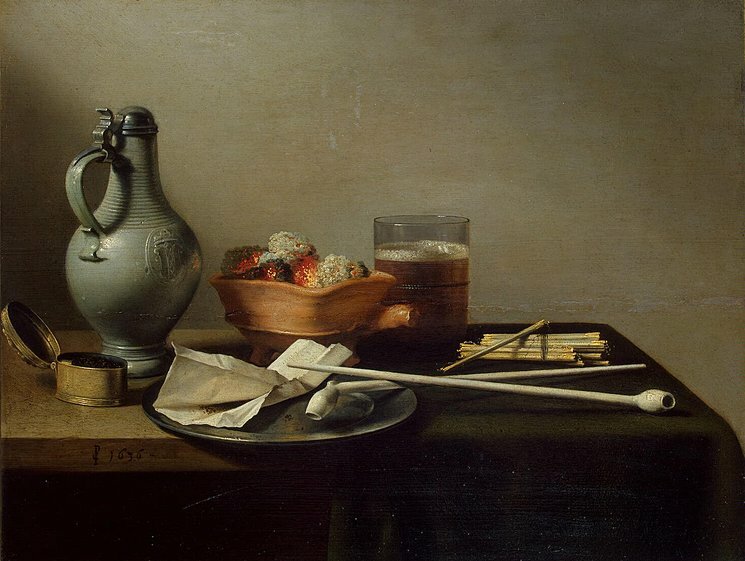 Tobacco Pipes and a Brazier 1636 (Hermitage) by the Dutch still-life painter Pieter Claesz showing a very similar form to the older pipe bowl above. Two other common items that can do with a little background are the oyster shells and the animal bones. Oysters have been native to the Thames Estuary since the beginnings of time apparently, and it was only relatively recently that they ceased to be a major food source especially for the poor. So the abundance of their discarded shells along the London Thames is more than accounted for by that fact, whether or not the river itself supports them or how much they’ve been specially farmed here in the past. 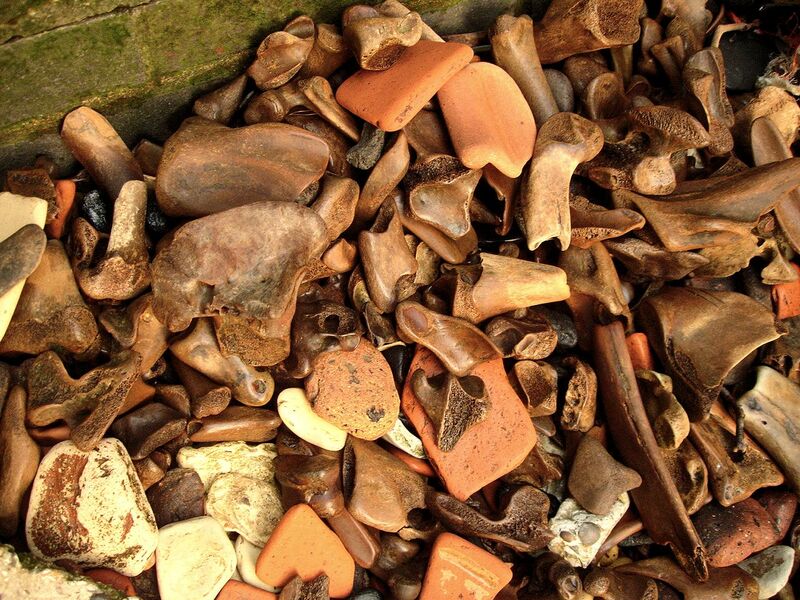 The same applies to the animal bones .. the city’s unusable leftovers tipped into the Thames for hundreds of years. As far as I know the common ingredients are sheep, cow, goat, pig and poultry, perhaps with a portion of horse and even a smattering of boar, especially in the Greenwich area where the Tudor royal palace used to be. It’s tempting to think this .. that the concentration of bones in the Greenwich area relates either to 200 years of Tudor/Stuart feasting or to the 19th century Foreign Cattle Market at neighbouring Deptford .. but I’m not so sure. I suspect it has more to do with the river bends and the way these influence where the tidal currents deposit different things. Greenwich has a high concentration because it’s at the centre of a ‘concave’ and the same applies to Wapping where the above photo was taken. On a recent visit to part of Rotherhithe on the opposite side, i.e. on the ‘convex’, I noticed there were surprisingly few. After the stones, the bones and the oyster shells, the next most noticeable without really trying are the fragments of pottery .. or ‘potsherds’ as they’re often referred to, mainly because it’s the kosher archaeological term. One doesn’t go down to the Thames foreshore seeking a complete pot .. you’ll have to go to either a museum or an antiquities dealer for those .. although apparently there have been rare occasions! But I don’t think it’s widely known how significantly old these fragments can be .. surprisingly many can date back to the Roman occupation or even earlier! The problem with most of them especially if water-worn .. is proving that .. if only to oneself. So it’s always more satisfying to find a fragment which has an unmistakable shape, a definitive pattern, an identifiable colour or glaze. 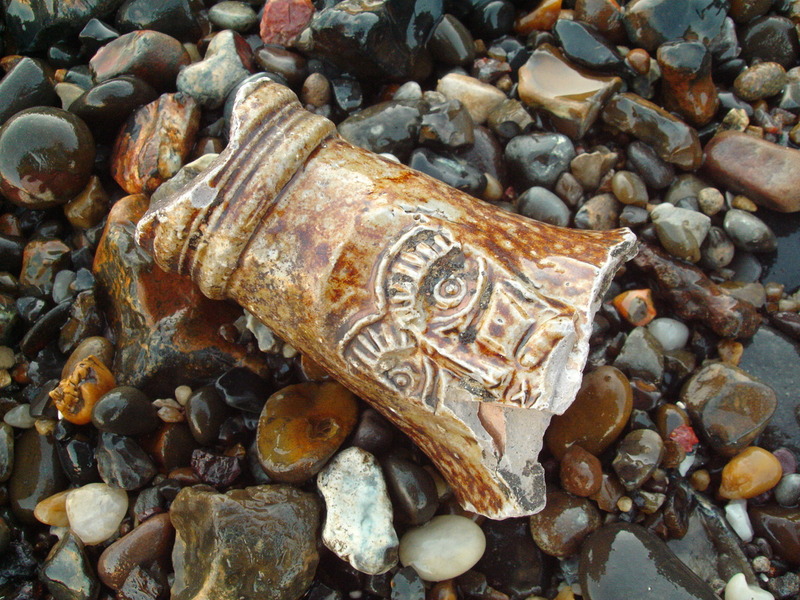 There are a surprising number of 17th-18th century fragments, most commonly cream-coloured slipware or white/blue Delftware which are easily recognisable after one’s seen the first .. even more so the pieces of 16th-17th century Bartmann or ‘Bellarmine’ bottle/jugs. Above is part of the trademark bearded face from an 18th century German Bartmann jug and below a small piece of 18th century English slipware. Then there is the limitless count of things which, on the one hand, anyone can come across by incredible chance or ‘fate’ at any time and in any place without trying, but which on the other hand one’s much more likely to come across by putting in some time and effort. I mean the coins dropped throughout the millennia back to even before there were pockets; the tokens, some just as old, which were used in place of money; the religious badges or emblems which pilgrims could buy; the many and various tools, including weapons, used on or around the Thames foreshore .. the list is, as I say, unlimited. Except perhaps in one respect .. purposefully buried treasure! .. because who in their right mind would choose to do so in a place where they could be so easily seen doing it and who, with any knowledge of the Thames, would choose such a fluid and changeable location? How can you improve your chances? As I’ve suggested, if you’re happy to remain fairly casual about whether you find anything or not then all you need to do is look downwards and let fate decide the rest. If you’re more ‘engaged’, to the point of feeling that you really ‘deserve’ to find something .. that state of mind will certainly help! But added to that, a little preparatory knowledge is bound to help even more. In the first place you should go a little before low tide, to experience the location at its fullest. Most are varied beaches, as I’ve said, likely to include areas of dry shingle higher up; mixture patches of stones/sand/mud lower down; and lastly wetter, usually older mud nearest the waterline .. you should check out all of them! You may observe while doing so that certain materials or fragments have tended to rest together along the same ‘tide-mark’. Often, though not always, if you find interesting things along one of these, following the same level along the beach or the ‘mark’ if it’s visible will reveal more. Mudlarkers refer to these as find lines but they might be looking for different ones because they’ve learnt the value of scraping under the surface. Often a darker tone of debris, perhaps even including darker sand or silt, may indicate an earlier ‘historical’ seam. But don’t take the word ‘seam’ too literally because these aren’t arranged as clearly and logically as strata in a cliff face. Another one of the mudlarkers’ favourite phrases is ‘getting your eye in’ or as I think of it, being tuned to the tell-tale signs of ‘otherness’. Much simplified, if you’re after the usual things I’d recommend you tune your eye to pick up circles and parallel lines for a start. 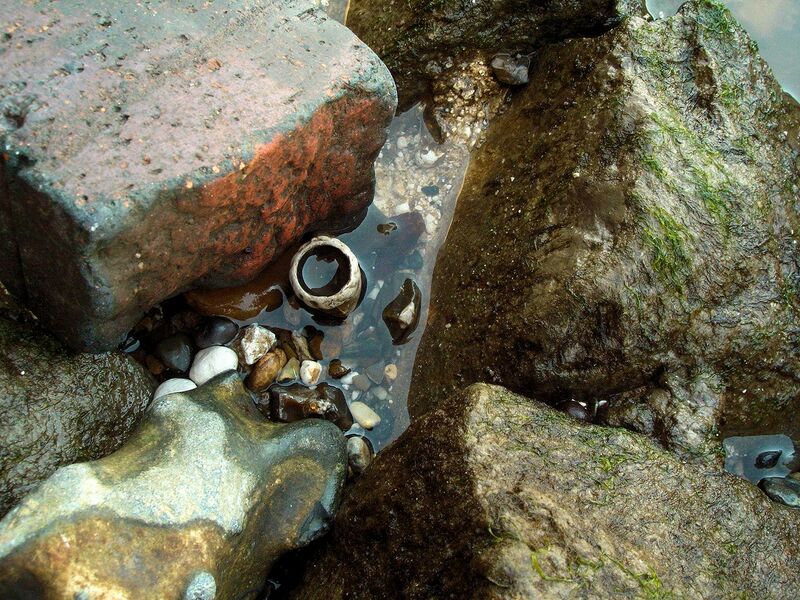 Proper circles, or parts of them and especially ‘rings’, are not native to this environment so they can denote pipe-bowls facing upwards, ends of bottles, bases or rims of pots .. and coins! Neither are regular parallel lines ‘natural’ here .. they’re one of the chief indications of the man-made .. and here they may denote most forms of decoration or simply ‘something straight’. Of course, colour difference can often be the strongest indication generally and it’s a happy coincidence that the raw umber colour of Thames mud is perfectly balanced to contrast equally with pale pipe-clay and warm terracotta. But up against the shingle the competition of colours is fiercer so here especially one is much more dependant on form. As an illustration of this, the photo above is what I was lucky enough to notice on a recent visit to my local stretch of Deptford foreshore, and below is what it turned out to be. 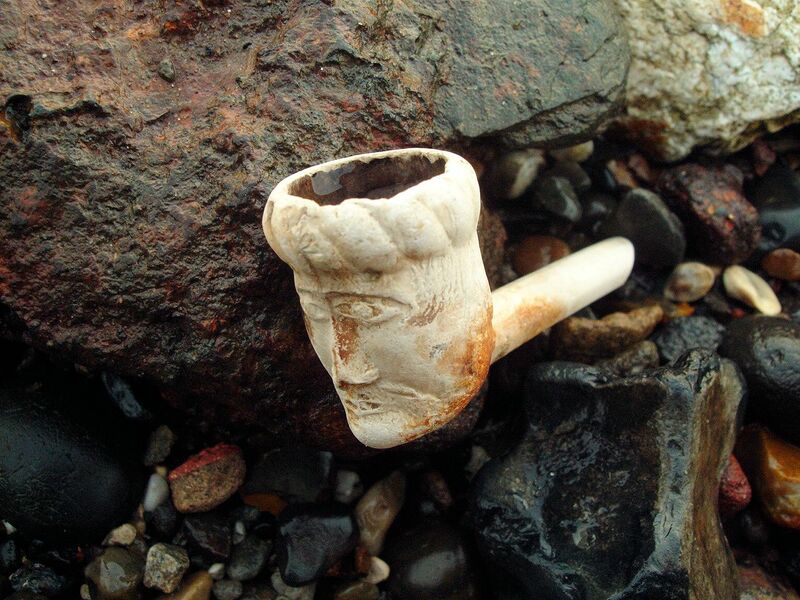 This was a popular form of pipe for a while in the mid 19th century but they’re not a common Thames find and they weren’t a great deal longer than what’s been left here. These male heads were often of dragoons or Turks, presumably because of the convenient headgear shapes. For me it always ‘marks the day’ when I find a particular type of item I haven’t found before, like when I found my first ‘wig curler’ which was only the smallest of fragments rather than a complete one, but that hardly mattered. I’d estimate that even when one knows the beach and its ‘hot spots’; however experienced one might be at searching and however well-tuned the eye happens to be that day .. the chances of seeing even what’s lying in one’s path can’t be more than 50%. This is because unless you’re standing still you have to swing your gaze to-and-fro while moving, so there’s always an equal chance that something is on the ‘fro’ while you’re on the ‘to’! But I really think that’s as it should be .. it means that other people get a ‘look in’ after you, including yourself at another time. The next illustrates the importance of having an eye for parallel lines, for which I’m using photos courtesy of Lara Maiklem (@london.mudlark). What she first spotted was this .. the hint of a stoneware colour, but otherwise the only marks distinguishing it from its surroundings were a few incised lines. 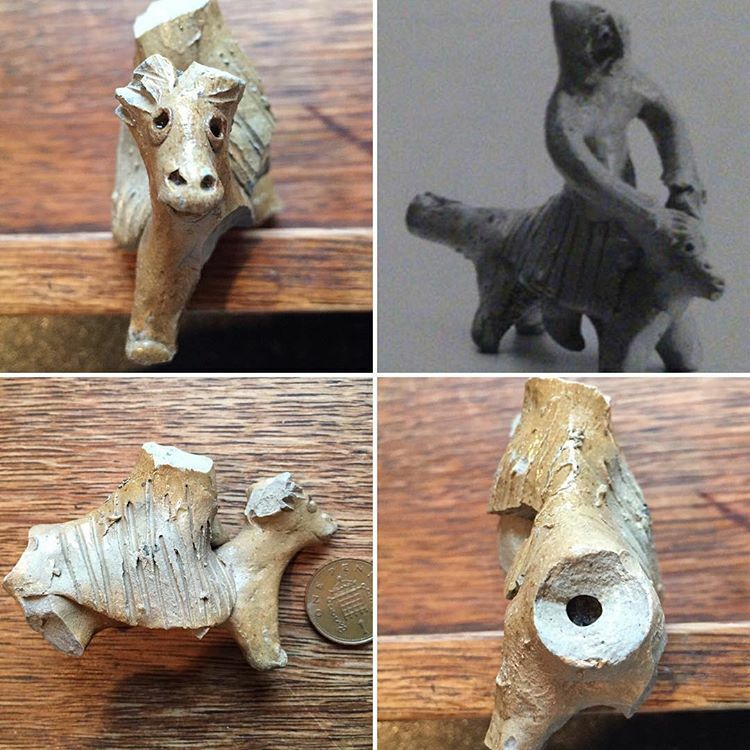 Only a small part of it was visible and it turned out to be part of a 14th century toy whistle from the Netherlands. She was able to identify it so precisely after posting it on her Facebook site because it received a response from someone who had seen a near- identical one in a Dutch collection, shown in the b/w photo. Lastly, if you’re looking for success .. you just have to put the time in! Often, after checking first when at least some of the beach is even accessible, I’ll be down there 2 hours before low tide and stay around until 2 hours after. It may be annoying at times but I’m thankful for the limit the tide imposes .. otherwise I’d be spending far too much time down there for my own good!